The American Cemetery was our final destination the day we visited Normandy. The grounds, landscaped with perfectly shaped trees and gardens, were well ordered. The blue waters of the English Channel framed the far side of the cemetery, and along the walk we could view cliffs in the distance. The beach, stretching for miles, vast and remote, rested against a scrub forest. On the carefully manicured lawn rows and rows of grave markers stood at attention facing the West. The trees swayed in a gentle breeze as the stillness of the markers remained ever-present. 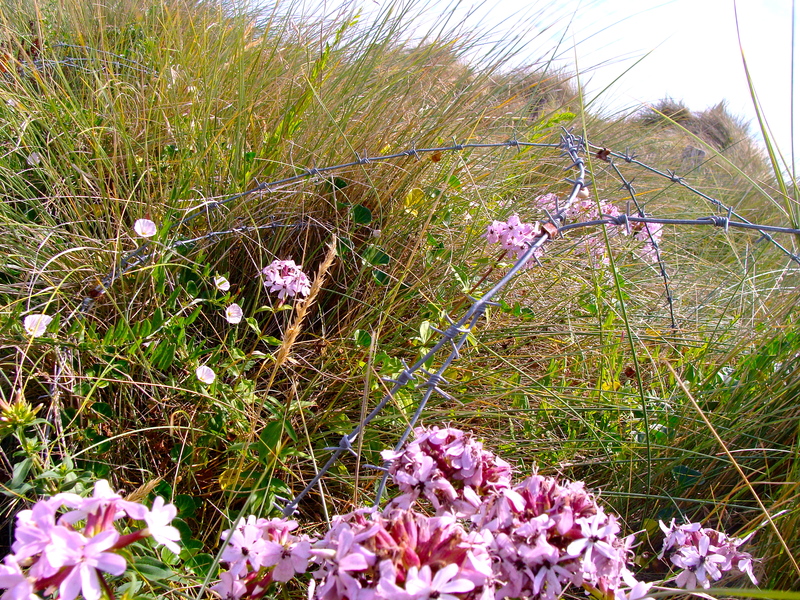 On the dunes below the cemetery, we found these delicate pink blossoms entangled in barbed wire. Does nature, with all its power and delicacy finally decide what will remain? Man’s puny efforts to conquer the world are nothing compared to the power of the earth to reclaim its rightful place. How horribly painfully sad it is that we fight our own better nature’s claim to grow with the earth, all in this childish pique of hubris.